How crazy is Masters week in Augusta, Georgia? Schools shut for the entire week, for one thing. More than a dozen pros will tame the madness at the 78th Masters by chartering their own private jets to help tailor their preparation for the year’s first major tournament to their schedules. Patrons, as spectators at Augusta National Golf Club are referred, can take advantage of the same conveniences by hiring a jet to ease travel headaches and insure a Masters Week experience that is hassle-free and unforgettable. Your inflight meal can mimic the concessionaires at Augusta National. Start with the traditional sandwiches, pimento cheese and the tournament’s best-selling egg salad. White bread is mandatory but sandwich constructors cannot replicate the exact pimento spread since the recipe is a Masters Tournament proprietary secret. And of course all sandwiches must be wrapped in green wax paper. For hot foods the main dishes on any Masters menu must include the go-to Southern tandem of country fried chicken and chicken fried steak. You will want to have the soothing strains of the Masters television theme song piped through your jet’s sound system. The tune has a name – “Augusta” – and a composer, Dave Loggins. Willie Nelson and Don Cherry recorded a full version of the song, including the seldom-heard golf-worshipping lyrics. 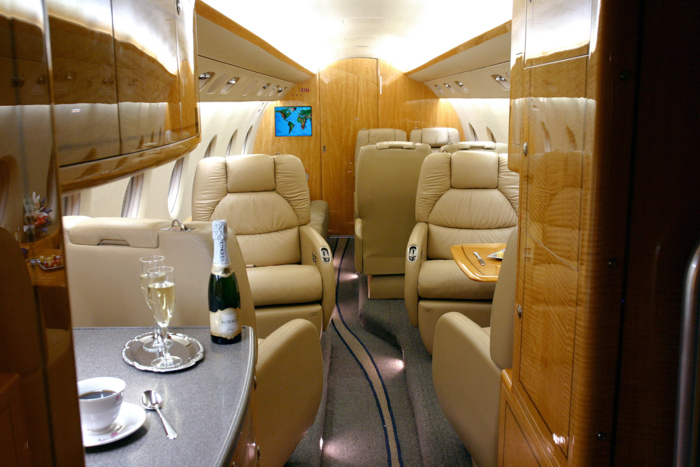 View the interior of our Fleet of private jets or go to our website at www.DuPageAerospace.com. Tiger Woods will be playing in his 20th Masters this year, looking to win his fifth Green Jacket. He will be the field favorite going into Augusta even though an ailing back has forced him into the worst start of his career in 2014. He hasn’t won this tournament since 2005 nor any major since the 2008 United States Open. Phil Mickelson is looking to add a fourth Green Jacket to his locker and become at age 43 the oldest winner since Jack Nicklaus won his memorable sixth title in 1986. Popular 2013 champion Adam Scott, the #2 ranked player in the world, will be looking to become only the fourth player to win consecutive Masters Titles. Exciting rookies to watch will be 35-year old Jimmy Walker and Augusta State College graduate Patrick Reed who have each won twice already on the 2014 PGA Tour. One of the new things to look for on the golf course will be at the 17th hole where an ice storm this winter forced the removal of the 125-year old loblolly pine that guarded the left side of the fairway. Dwight D. Eisenhower, a long-time club member belted so many tee balls into that tree that in 1956 he lobbied for its removal. The general who won WWII and the sitting President of the United States ran into an opponent he could not defeat – the powers that be at Augusta National. Whether or not the Masters will be able to replace the famous Eisenhower Tree before this year’s tournament remains to be seen. Golf immortal Bobby Jones built Augusta National on an old fruit orchard. But you could have watched every Masters telecast your entire golfing life and never realized that America’s most beautiful parkland course is practically in downtown Augusta. No CBS announcer has ever let slip the fact that fabled Magnolia Lane leading 330 yards to the clubhouse (you can look in through the gates from the street) is across from a strip mall. It is called, some would say blasphemously, the Masters Plaza. Augusta is Georgia’s “second city” – second in size to Atlanta and second in age to Savannah. Perched on the Savannah River, the town was the Arsenal of the Confederacy and has a rich Civil War history. Augusta culture is on display along Broad Street that was laid out by the founder of Georgia, James Oglethorpe, in 1735. On the common you will find the celebrated bronze statue of Augusta’s favorite son – the Godfather of Soul, James Brown. Metropolitan Augusta is serviced by four airports, all of which have instituted parking reservation requirements for the week of the 2014 Masters. Most fans arriving via private jet charter will choose to fly into the city at Augusta Regional Airport or Daniel Field whose runways skirt the city’s municipal golf course but others will opt for Aiken Municipal Airport across the Savannah River in South Carolina horse country where families like the Whitneys and Vanderbilts come for the winter. Four other airports are located within 50 miles of August National: Burke County Airport in Waynesboro GA, Wexford Landing Airport in Aiken SC, Twin Lakes Airport in Graniteville SC and Barnwell Regional Airport in Barnwell, SC. Unlike the Super Bowl the Federal Aviation Administration has never imposed flight restrictions on the skies above the 955-acre Augusta National Golf Club. Private Jet Charter has been flying golf fans in luxury across five time zones for over 20 years and knows the ins and outs of special air traffic procedures in effect during this busy week to minimize your travel delays. The Masters is the toughest ticket in golf. It is also the best-run tournament in golf. If the azaleas had a bad winter and are not ready to bloom when the television cameras go on, they are forced into magnificent display. Not a piece of pine straw is out of place. Patrons have come to count on that meticulousness year after year from the Masters and Augusta National Golf Club. And they want the same attention to detail from their transportation service, a standard that can only be achieved by a private jet charter – and the way we do service at DuPage Aerospace – Private Jet Charter. Contact us at 630-513-2222 for your travel consultation for the Masters or any other popular event.